Hello! Well I don't know if I have yet viewed a challenge, made the card and put up the post in less than 24 hours (on a weekday) till now! As many of you know, sometimes putting together a card can take much longer than we think, especially if there are lots of elements! I then came across an owl card in the Fall issue of Paper Creations Magazine and I was inspired to recreate the inverted die cut shapes by an owls eyes, serving as the upper and lower levels of the card. After quickly deciding on the adorable owl from the Cricut Create a Critter cartridge (which btw has soooo many adorable animals) I grabbed a new 6x6 mini pad of the Indie Chic "Nutmeg" from My Minds Eye. I thought the blues and yellows were just so smart looking for the owl. As I was assembling him my rub on mustaches lept out at me! I think the "stashe" is just fab on that owls face!!! After switching the composition around a few times, I finally decided around 12am to give in to the idea to putting a door on the card, which gave its primary CASE'd element, the layered negative use of the die cut. I finished the door with a T.H. Fastener, some wood grain embossing and Vintage Photo ink. The hinges are my own paper duplications of the Graphic45 metal hinges. Squares were cut out of the door using the very small Movers and Shapers Dies called "Mini Openings"...I just picked that up this week at Tuesday Morning. I cut out a piece of clear packaging with the die and used some glossy accents to attatch it to the back of the door die cut. It added some nice stability to the paper. I just love how the owls vintage button eyes are peeking through the windows. I thought the cabinet door would work great in front of the owl! It's a nice surprise seeing the owl behind the door and yet framed by a negative of the die. So the door then became a part of a house and a house needs a roof so my card was becoming an XL version of it's former self! I layered some kraft paper, which was cut out with the Sizzix/TH On the Edge Scallop and Pinking die, onto an triangle, which became a layered Kraft roof. Lastly I added a festive banner folding over some blue Bakers twine with clipped notches into scraps of the left over Design Paper. Pearls and stars were added to jazz up the banner a bit more. Lastly I added alpha stickers (which do not photograph well, at all, due to their light yellow color, :( SORRY). "The sentiment which is a play on the old fashioned "Knock, Knock joke". I substituted "Hoo Hoots here" instead of "Whose there?" 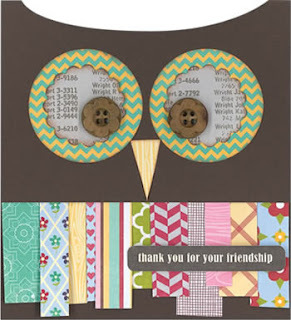 I just adore this oversized card and think I know just the right recipient who loves owls! Thanks for hanging in there with this photo-rich post! 365 Cards - Day 201 - "Flagged"
Ooh this is too cool... so much work too! All I can say is WOW! Thanks for joining us at CASE Study! Adrienne, this is such a fun & clever design. I love that door. I saw this on MIM and came over for a closer look. **If you would like to be a Guest Designer with us please add GDT to your entry. At the end of every challenge one(random) winner will be chosen. 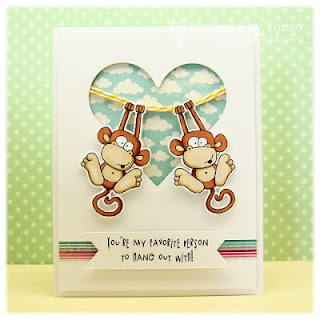 I spotted your wonderful creation over at Make it Monday and had to visit and take a closer look. TFS! My entries are # 74, # 78, # 224 and # 231. I am so thankful you entered our Challenge. I so love your inspiration creation. I wish you well in the this week's Challenge. We hope to see you back next week. Adorable cards. Thanks so much for playing along with us at The Kraft Journal!